B lymphocytes are the cells of the immune system that make antibodies to neutralize invading pathogens like viruses. They form memory cells that remember the same pathogen for faster antibody production in future infections. B cells are lymphocytes (a class of white blood cells) that play a large role in the adaptive immune system by making antibodies to identify and neutralize invading pathogens like bacteria and viruses. Specifically, B cells play a prominent role in the humoral immune response, as opposed to the cell-mediated immune response that is governed by T cells, another type of lympocyte. The humoral immune system involves complex coordination that is truly remarkable. The human body can produce millions of types of B cells, each with a unique receptor protein. This allows protection against millions of possible pathogens—all the while recognizing those cells that are part of the body and are not to be attacked, specifically mobilizing against invaders. The abbreviation "B" comes from bursa of Fabricius, an organ in birds in which avian B cells mature. (It does not stand for bone marrow, where B cells are produced in all other vertebrates except for rabbits. B cells were originally observed in studies done on immunity in chickens.) They are also called B lymphocytes. B cells are part of the adaptive immune system, also called the "acquired immune system, and "specific immune system." The system involves processes whereby animals that survive an initial infection by a pathogen are generally immune to further illness caused by that same pathogen. The basis of specific immunity lies in the capacity of immune cells to distinguish between proteins produced by the body's own cells ("self" antigen), and proteins produced by invaders or cells under control of a virus ("non-self" antigen). In many species, the adaptive immune system can be divided into two major sections, the humoral immune system and the cell-mediated immune system. The B cells are part of the humoral immune system. The humoral immune system acts against bacteria and viruses in the body liquids by means of proteins, called immunoglobulins (also known as antibodies), which are produced by B cells. Secreted antibodies bind to antigens on the surfaces of invading microbes (such as viruses or bacteria), which flags them for destruction. An antigen is any substance that causes the immune system to produce antibodies. The human body has the ability to form millions of different types of B cells each day, and each type has a unique receptor protein (referred to as the B cell receptor, BCR) on its membrane that will bind to one particular antigen. At any one time in the human body there are B cells circulating in the blood and lymph, but are not producing antibodies. Once a B cell encounters its cognate antigen and receives an additional signal from a helper T cell, it can further differentiate into one of two types of B cells. B cells need two signals to initiate activation. 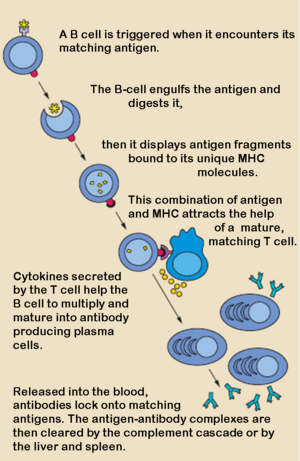 Most antigens are T-dependent, meaning T cell help is required for maximal antibody production. With a T-dependent antigen, the first signal comes from antigen cross linking BCR (B cell receptor) and the second from the Th2 cell. Some antigens are T-independent, meaning they can deliver both the antigen and the second signal to the B cell. 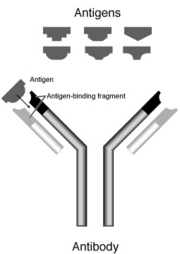 The antibodies that a single B lymphocyte produces can differ in their heavy chain, and the B cell often expresses different classes of antibodies at the same time. However, they are identical in their specificity for antigen, conferred by their variable region. To achieve the large number of specificities the body needs to protect itself against many different foreign antigens, it must produce millions of B lymphoyctes. In order to produce such a diversity of antigen binding sites for each possible antigen, the immune system would require many more genes than exist in the genome. It was Susumu Tonegawa who showed, in 1976, that portions of the genome in B lymphocytes can recombine to form all the variation seen in the antibodies and more. Tonegawa won the Nobel Prize in Physiology or Medicine in 1987, for his discovery. 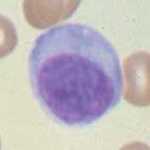 B cells are produced in the bone marrow of most mammals. Rabbits are an exception; their B cells develop in the appendix-sacculus rotundus. B cell development occurs through several stages, each stage representing a change in the genome content at the antibody loci. An antibody is composed of two light (L) and two heavy (H) chains, and the genes specifying them are found in the "H" chain locus and the "L" chain locus. In the H chain loci, there are three regions, V, D, and J, which recombine randomly, in a process called VDJ recombination, to produce a unique variable domain in the immunoglobulin of each individual B cell. Similar rearrangements occur for L chain locus except there are only two regions, V and J. The list below describes the process of immunoglobulin formation at the different stages of B cell development. Immature B cells—VJ rearranged on L chains, VDJ rearranged on H chains. There is start of expression of IgM receptors. When the B cell fails in any step of the maturation process, it will die by a mechanism called apoptosis. If it recognizes self-antigen during the maturation process, the B cell will become suppressed (known as anergy) or undergo apoptosis. B cells are continuously produced in the bone marrow, but only a small portion of newly made B cells survive to participate in the long-lived peripheral B cell pool. The human body makes millions of different types of B cells each day that circulate in the blood and lymph, performing the role of immune surveillance. They do not produce antibodies until they become fully activated. Each B cell has a unique receptor protein, the B cell receptor (BCR), on its surface, that will bind to one particular antigen. The BCR is a membrane-bound immunoglobulin, and it is this molecule that forms the distinction of B cells from other types of lymphocytes, as well as being the main protein involved in B cell activation. Once a B cell encounters its cognate antigen and receives an additional signal from a T helper cell, it can further differentiate into one of the two types of B cells listed below. Mature B cells differentiate into either plasma B cells or memory B cells. The B cell may either become one of these cell types directly, or it may undergo an intermediate differentiation step, the germinal center reaction, where the B cell will hypermutate the variable region of its immunoglobulin gene and possibly undergo class switching. During the initial stages of an immune response, the lifespan of plasma cells is very short, typically only a few days to weeks. However, following the process of affinity maturation, plasma cells can survive for months to years and continue to secrete high levels of antibodies. Memory B cells tend to be longer-lived and can therefore respond quickly upon second exposure to an antigen. In the wake of first (primary response) infection involving a particular antigen, the responding naїve (ones which have never been exposed to the antigen) cells proliferate to produce a colony of cells, most of which transform into the plasma cells or the effector B cells (which produce the antibodies) and clear away with the resolution of infection, and the rest persist as the memory cells that can survive for years, or indeed even for a lifetime. Plasma B cells (also known as plasma cells) are large B cells that have been exposed to antigen and are producing and secreting large amounts of antibodies, which assist in the destruction of microbes by binding to them and making them easier targets for phagocytes and activation of the complement system. They are sometimes referred to as antibody factories. Most plasma B cells travel to the spleen or bone marrow to secrete antibodies (approximately 10,000 per second). An electron micrograph of these cells reveals large amounts of rough endoplasmic reticulum, responsible for synthesizing the antibody, in the cell's cytoplasm. 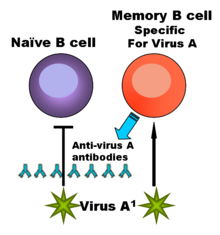 Memory B cells are a B cell sub-type that are formed following primary infection. They are formed from activated B cells that are specific to the antigen encountered during the primary immune response. These cells are able to live for a long time, and can respond quickly following a second exposure to the same antigen. B-1 cells express IgM in greater quantities than IgG and its receptors show polyspecificity, meaning that they have low affinities for many different antigens, but have a preference for other immunoglobulins, self antigens, and common bacterial polysaccharides. B-1 cells are present in low numbers in the lymph nodes and spleen and are instead found predominantly in the peritoneal and pleural cavities. B-2 cells are the conventional B cells most texts refer to. A critical difference between B cells and T cells is how each lymphocyte "sees" its antigen. B cells recognize their cognate antigen in its native form. They recognize free (soluble) antigen in the blood or lymph using their BCR or membrane bound-immunoglobulin. In contrast, T cells recognize their cognate antigen in a processed form, as a peptide fragment presented by an antigen-presenting cell's major histocompatibility complex (MHC) molecule to the T cell receptor. B cell recognition of antigen is not the only element necessary for B cell activation (a combination of clonal proliferation and terminal differentiation into plasma cells). B cells that have not been exposed to antigen, also known as "Naive B cells," can be activated in a T-cell dependent or independent manner. In an October 2006, issue of Nature Immunology, it was reported that certain B-cells of primitive vertebrates (like fish and amphibians) are capable of phagocytosis, a function usually associated with cells of the innate immune system. The authors of this article postulate that these phagocytic B-cells represent the ancestral history shared between macrophages and lymphocytes; B-cells may have evolved from macrophage-like cells during the formation of the adaptive immune system (Li et al. 2006). Li, J., D. R. Barreda, Y. A. Zhang, H. Boshra, A. E. Gelman, S. LaPatra, L. Tort, and J. O. Sunyer. 2006. B lymphocytes from early vertebrates have potent phagocytic and microbicidal abilities. Nature Immunology 7: 1116–1124.